Newage® test blocks for Rockwell scales are ideal for verifying your Rockwell hardness testing system. 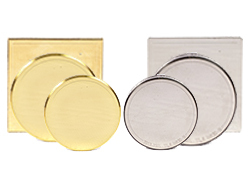 Rockwell test blocks serve as a reference, with each block having an average hardness value. The hardness value of each block is a nominal value. All blocks have a typical hardness variation based on the nominal value of the block. Typically, you should test and verify your hardness testing system daily against a Newage test block. Newage test blocks for the Rockwell scales include “routine” type blocks and Yamamoto high accuracy test blocks. NIST certification is available for Rockwell C Scale test blocks. Scale: HR15N, Value: 70 (+/-3), Traceable: No, Indenter: Diamond, Block Size: 2" x 2"
Scale: HR15N, Value: 75 (+/-3), Traceable: No, Indenter: Diamond, Block Size: 2" x 2"
Scale: HR15N, Value: 80 (+/-3), Traceable: No, Indenter: Diamond, Block Size: 2" x 2"
Scale: HR15N, Value: 85 (+/-3), Traceable: No, Indenter: Diamond, Block Size: 2" x 2"
Scale: HR15N, Value: 90 (+/-3), Traceable: No, Indenter: Diamond, Block Size: 2" x 2"
Scale: HR15T, Value: 70 (+/-3), Traceable: No, Indenter: 1/16" Steel, Block Size: 2" x 2"
Scale: HR15T, Value: 75 (+/-3), Traceable: No, Indenter: 1/16" Steel, Block Size: 2" x 2"
Scale: HR15T, Value: 80 (+/-3), Traceable: No, Indenter: 1/16" Steel, Block Size: 2" x 2"
Scale: HR15T, Value: 85 (+/-3), Traceable: No, Indenter: 1/16" Steel, Block Size: 2" x 2"
Scale: HR15T, Value: 90 (+/-3), Traceable: No, Indenter: 1/16" Steel, Block Size: 2" x 2"
Scale: HR15T, Value: 70 (+/-3), Traceable: No, Indenter: 1/16" Carbide, Block Size: 2" x 2"
Scale: HR15T, Value: 75 (+/-3), Traceable: No, Indenter: 1/16" Carbide, Block Size: 2" x 2"
Scale: HR15T, Value: 80 (+/-3), Traceable: No, Indenter: 1/16" Carbide, Block Size: 2" x 2"
Scale: HR15T, Value: 85 (+/-3), Traceable: No, Indenter: 1/16" Carbide, Block Size: 2" x 2"
Scale: HR15T, Value: 90 (+/-3), Traceable: No, Indenter: 1/16" Carbide, Block Size: 2" x 2"
Scale: HR30N, Value: 40 (+/-3), Traceable: No, Indenter: Diamond, Block Size: 2" x 2"
Scale: HR30N, Value: 45 (+/-3), Traceable: No, Indenter: Diamond, Block Size: 2" x 2"
Scale: HR30N, Value: 50 (+/-3), Traceable: No, Indenter: Diamond, Block Size: 2" x 2"
Scale: HR30N, Value: 55 (+/-3), Traceable: No, Indenter: Diamond, Block Size: 2" x 2"
Scale: HR30N, Value: 60 (+/-3), Traceable: No, Indenter: Diamond, Block Size: 2" x 2"
Scale: HR30N, Value: 65 (+/-3), Traceable: No, Indenter: Diamond, Block Size: 2" x 2"
Scale: HR30N, Value: 70 (+/-3), Traceable: No, Indenter: Diamond, Block Size: 2" x 2"
Scale: HR30N, Value: 75 (+/-3), Traceable: No, Indenter: Diamond, Block Size: 2" x 2"
Scale: HR30N, Value: 80 (+/-3), Traceable: No, Indenter: Diamond, Block Size: 2" x 2"
Scale: HR30T, Value: 35 (+/-3), Traceable: No, Indenter: 1/16" Steel, Block Size: 2" x 2"
Scale: HR30T, Value: 40 (+/-3), Traceable: No, Indenter: 1/16" Steel, Block Size: 2" x 2"
Scale: HR30T, Value: 45 (+/-3), Traceable: No, Indenter: 1/16" Steel, Block Size: 2" x 2"
Scale: HR30T, Value: 50 (+/-3), Traceable: No, Indenter: 1/16" Steel, Block Size: 2" x 2"
Scale: HR30T, Value: 55 (+/-3), Traceable: No, Indenter: 1/16" Steel, Block Size: 2" x 2"
Scale: HR30T, Value: 60 (+/-3), Traceable: No, Indenter: 1/16" Steel, Block Size: 2" x 2"
Scale: HR30T, Value: 65 (+/-3), Traceable: No, Indenter: 1/16" Steel, Block Size: 2" x 2"
Scale: HR30T, Value: 70 (+/-3), Traceable: No, Indenter: 1/16" Steel, Block Size: 2" x 2"
Scale: HR30T, Value: 75 (+/-3), Traceable: No, Indenter: 1/16" Steel, Block Size: 2" x 2"
Scale: HR30T, Value: 80 (+/-3), Traceable: No, Indenter: 1/16" Steel, Block Size: 2" x 2"
Scale: HR30T, Value: 35 (+/-3), Traceable: No, Indenter: 1/16" Carbide, Block Size: 2" x 2"
Scale: HR30T, Value: 40 (+/-3), Traceable: No, Indenter: 1/16" Carbide, Block Size: 2" x 2"
Scale: HR30T, Value: 45 (+/-3), Traceable: No, Indenter: 1/16" Carbide, Block Size: 2" x 2"
Scale: HR30T, Value: 50 (+/-3), Traceable: No, Indenter: 1/16" Carbide, Block Size: 2" x 2"
Scale: HR30T, Value: 55 (+/-3), Traceable: No, Indenter: 1/16" Carbide, Block Size: 2" x 2"
Scale: HR30T, Value: 60 (+/-3), Traceable: No, Indenter: 1/16" Carbide, Block Size: 2" x 2"
Scale: HR30T, Value: 65 (+/-3), Traceable: No, Indenter: 1/16" Carbide, Block Size: 2" x 2"
Scale: HR30T, Value: 70 (+/-3), Traceable: No, Indenter: 1/16" Carbide, Block Size: 2" x 2"
Scale: HR30T, Value: 75 (+/-3), Traceable: No, Indenter: 1/16" Carbide, Block Size: 2" x 2"
Scale: HR30T, Value: 80 (+/-3), Traceable: No, Indenter: 1/16" Carbide, Block Size: 2" x 2"
Scale: HR45N, Value: 25 (+/-3), Traceable: No, Indenter: Diamond, Block Size: 2" x 2"
Scale: HR45N, Value: 30 (+/-3), Traceable: No, Indenter: Diamond, Block Size: 2" x 2"
Scale: HR45N, Value: 35 (+/-3), Traceable: No, Indenter: Diamond, Block Size: 2" x 2"
Scale: HR45N, Value: 40 (+/-3), Traceable: No, Indenter: Diamond, Block Size: 2" x 2"
Scale: HR45N, Value: 45 (+/-3), Traceable: No, Indenter: Diamond, Block Size: 2" x 2"
Scale: HR45N, Value: 50 (+/-3), Traceable: No, Indenter: Diamond, Block Size: 2" x 2"
Scale: HR45N, Value: 55 (+/-3), Traceable: No, Indenter: Diamond, Block Size: 2" x 2"
Scale: HR45N, Value: 60 (+/-3), Traceable: No, Indenter: Diamond, Block Size: 2" x 2"
Scale: HR45N, Value: 65 (+/-3), Traceable: No, Indenter: Diamond, Block Size: 2" x 2"
Scale: HR45N, Value: 70 (+/-3), Traceable: No, Indenter: Diamond, Block Size: 2" x 2"
Scale: HR45T, Value: 10 (+/-3), Traceable: No, Indenter: 1/16" Steel, Block Size: 2" x 2"
Scale: HR45T, Value: 15 (+/-3), Traceable: No, Indenter: 1/16" Steel, Block Size: 2" x 2"
Scale: HR45T, Value: 20 (+/-3), Traceable: No, Indenter: 1/16" Steel, Block Size: 2" x 2"
Scale: HR45T, Value: 25 (+/-3), Traceable: No, Indenter: 1/16" Steel, Block Size: 2" x 2"
Scale: HR45T, Value: 30 (+/-3), Traceable: No, Indenter: 1/16" Steel, Block Size: 2" x 2"
Scale: HR45T, Value: 35 (+/-3), Traceable: No, Indenter: 1/16" Steel, Block Size: 2" x 2"
Scale: HR45T, Value: 40 (+/-3), Traceable: No, Indenter: 1/16" Steel, Block Size: 2" x 2"
Scale: HR45T, Value: 45 (+/-3), Traceable: No, Indenter: 1/16" Steel, Block Size: 2" x 2"
Scale: HR45T, Value: 50 (+/-3), Traceable: No, Indenter: 1/16" Steel, Block Size: 2" x 2"
Scale: HR45T, Value: 55 (+/-3), Traceable: No, Indenter: 1/16" Steel, Block Size: 2" x 2"
Scale: HR45T, Value: 60 (+/-3), Traceable: No, Indenter: 1/16" Steel, Block Size: 2" x 2"
Scale: HR45T, Value: 65 (+/-3), Traceable: No, Indenter: 1/16" Steel, Block Size: 2" x 2"
Scale: HR45T, Value: 70 (+/-3), Traceable: No, Indenter: 1/16" Steel, Block Size: 2" x 2"
Scale: HR45T, Value: 10 (+/-3), Traceable: No, Indenter: 1/16" Carbide, Block Size: 2" x 2"
Scale: HR45T, Value: 15 (+/-3), Traceable: No, Indenter: 1/16" Carbide, Block Size: 2" x 2"
Scale: HR45T, Value: 20 (+/-3), Traceable: No, Indenter: 1/16" Carbide, Block Size: 2" x 2"
Scale: HR45T, Value: 25 (+/-3), Traceable: No, Indenter: 1/16" Carbide, Block Size: 2" x 2"
Scale: HR45T, Value: 30 (+/-3), Traceable: No, Indenter: 1/16" Carbide, Block Size: 2" x 2"
Scale: HR45T, Value: 35 (+/-3), Traceable: No, Indenter: 1/16" Carbide, Block Size: 2" x 2"
Scale: HR45T, Value: 40 (+/-3), Traceable: No, Indenter: 1/16" Carbide, Block Size: 2" x 2"
Scale: HR45T, Value: 45 (+/-3), Traceable: No, Indenter: 1/16" Carbide, Block Size: 2" x 2"
Scale: HR45T, Value: 50 (+/-3), Traceable: No, Indenter: 1/16" Carbide, Block Size: 2" x 2"
Scale: HR45T, Value: 55 (+/-3), Traceable: No, Indenter: 1/16" Carbide, Block Size: 2" x 2"
Scale: HR45T, Value: 60 (+/-3), Traceable: No, Indenter: 1/16" Carbide, Block Size: 2" x 2"
Scale: HR45T, Value: 65 (+/-3), Traceable: No, Indenter: 1/16" Carbide, Block Size: 2" x 2"
Scale: HR45T, Value: 70 (+/-3), Traceable: No, Indenter: 1/16" Carbide, Block Size: 2" x 2"
Scale: HRA, Value: 25 (+/-3), Traceable: No, Indenter: Diamond, Block Size: 2" x 2"
Scale: HRA, Value: 30 (+/-3), Traceable: No, Indenter: Diamond, Block Size: 2" x 2"
Scale: HRA, Value: 35 (+/-3), Traceable: No, Indenter: Diamond, Block Size: 2" x 2"
Scale: HRA, Value: 40 (+/-3), Traceable: No, Indenter: Diamond, Block Size: 2" x 2"
Scale: HRA, Value: 45 (+/-3), Traceable: No, Indenter: Diamond, Block Size: 2" x 2"
Scale: HRA, Value: 50 (+/-3), Traceable: No, Indenter: Diamond, Block Size: 2" x 2"
Scale: HRA, Value: 55 (+/-3), Traceable: No, Indenter: Diamond, Block Size: 2" x 2"
Scale: HRA, Value: 60 (+/-3), Traceable: No, Indenter: Diamond, Block Size: 2" x 2"
Scale: HRA, Value: 65 (+/-3), Traceable: No, Indenter: Diamond, Block Size: 2" x 2"
Scale: HRA, Value: 70 (+/-3), Traceable: No, Indenter: Diamond, Block Size: 2" x 2"
Scale: HRA, Value: 75 (+/-3), Traceable: No, Indenter: Diamond, Block Size: 2" x 2"
Scale: HRA, Value: 80 (+/-3), Traceable: No, Indenter: Diamond, Block Size: 2" x 2"
Scale: HRA, Value: 85 (+/-3), Traceable: No, Indenter: Diamond, Block Size: 2" x 2"
Scale: HRB, Value: 30 (+/-3), Traceable: No, Indenter: 1/16" Steel, Block Size: 2" x 2"
Scale: HRB, Value: 35 (+/-3), Traceable: No, Indenter: 1/16" Steel, Block Size: 2" x 2"
Scale: HRB, Value: 40 (+/-3), Traceable: No, Indenter: 1/16" Steel, Block Size: 2" x 2"
Scale: HRB, Value: 45 (+/-3), Traceable: No, Indenter: 1/16" Steel, Block Size: 2" x 2"
Scale: HRB, Value: 50 (+/-3), Traceable: No, Indenter: 1/16" Steel, Block Size: 2" x 2"
Scale: HRB, Value: 55 (+/-3), Traceable: No, Indenter: 1/16" Steel, Block Size: 2" x 2"
Scale: HRB, Value: 60 (+/-3), Traceable: No, Indenter: 1/16" Steel, Block Size: 2" x 2"
Scale: HRB, Value: 65 (+/-3), Traceable: No, Indenter: 1/16" Steel, Block Size: 2" x 2"
Scale: HRB, Value: 70 (+/-3), Traceable: No, Indenter: 1/16" Steel, Block Size: 2" x 2"
Scale: HRB, Value: 75 (+/-3), Traceable: No, Indenter: 1/16" Steel, Block Size: 2" x 2"
Scale: HRB, Value: 80 (+/-3), Traceable: No, Indenter: 1/16" Steel, Block Size: 2" x 2"
Scale: HRB, Value: 85 (+/-3), Traceable: No, Indenter: 1/16" Steel, Block Size: 2" x 2"
Scale: HRB, Value: 90 (+/-3), Traceable: No, Indenter: 1/16" Steel, Block Size: 2" x 2"
Scale: HRB, Value: 95 (+/-3), Traceable: No, Indenter: 1/16" Steel, Block Size: 2" x 2"
Scale: HRB, Value: 100 (+/-3), Traceable: No, Indenter: 1/16" Steel, Block Size: 2" x 2"
Scale: HRB, Value: 30 (+/-3), Traceable: No, Indenter: 1/16" Carbide, Block Size: 2" x 2"
Scale: HRB, Value: 35 (+/-3), Traceable: No, Indenter: 1/16" Carbide, Block Size: 2" x 2"
Scale: HRB, Value: 40 (+/-3), Traceable: No, Indenter: 1/16" Carbide, Block Size: 2" x 2"
Scale: HRB, Value: 45 (+/-3), Traceable: No, Indenter: 1/16" Carbide, Block Size: 2" x 2"
Scale: HRB, Value: 50 (+/-3), Traceable: No, Indenter: 1/16" Carbide, Block Size: 2" x 2"
Scale: HRB, Value: 55 (+/-3), Traceable: No, Indenter: 1/16" Carbide, Block Size: 2" x 2"
Scale: HRB, Value: 60 (+/-3), Traceable: No, Indenter: 1/16" Carbide, Block Size: 2" x 2"
Scale: HRB, Value: 65 (+/-3), Traceable: No, Indenter: 1/16" Carbide, Block Size: 2" x 2"
Scale: HRB, Value: 70 (+/-3), Traceable: No, Indenter: 1/16" Carbide, Block Size: 2" x 2"
Scale: HRB, Value: 75 (+/-3), Traceable: No, Indenter: 1/16" Carbide, Block Size: 2" x 2"
Scale: HRB, Value: 80 (+/-3), Traceable: No, Indenter: 1/16" Carbide, Block Size: 2" x 2"
Scale: HRB, Value: 85 (+/-3), Traceable: No, Indenter: 1/16" Carbide, Block Size: 2" x 2"
Scale: HRB, Value: 90 (+/-3), Traceable: No, Indenter: 1/16" Carbide, Block Size: 2" x 2"
Scale: HRC, Value: 20 (+/-3), Traceable: Yes, Indenter: Diamond, Block Size: 2" x 2"
Scale: HRC, Value: 25 (+/-3), Traceable: Yes, Indenter: Diamond, Block Size: 2" x 2"
Scale: HRC, Value: 30 (+/-3), Traceable: Yes, Indenter: Diamond, Block Size: 2" x 2"
Scale: HRC, Value: 35 (+/-3), Traceable: Yes, Indenter: Diamond, Block Size: 2" x 2"
Scale: HRC, Value: 40 (+/-3), Traceable: Yes, Indenter: Diamond, Block Size: 2" x 2"
Scale: HRC, Value: 45 (+/-3), Traceable: Yes, Indenter: Diamond, Block Size: 2" x 2"
Scale: HRC, Value: 50 (+/-3), Traceable: Yes, Indenter: Diamond, Block Size: 2" x 2"
Scale: HRC, Value: 55 (+/-3), Traceable: Yes, Indenter: Diamond, Block Size: 2" x 2"
Scale: HRC, Value: 60 (+/-3), Traceable: Yes, Indenter: Diamond, Block Size: 2" x 2"
Scale: HRC, Value: 65 (+/-3), Traceable: Yes, Indenter: Diamond, Block Size: 2" x 2"
Scale: HRD, Value: 40 (+/-3), Traceable: No, Indenter: Diamond, Block Size: 2" x 2"
Scale: HRD, Value: 45 (+/-3), Traceable: No, Indenter: Diamond, Block Size: 2" x 2"
Scale: HRD, Value: 50 (+/-3), Traceable: No, Indenter: Diamond, Block Size: 2" x 2"
Scale: HRD, Value: 55 (+/-3), Traceable: No, Indenter: Diamond, Block Size: 2" x 2"
Scale: HRD, Value: 60 (+/-3), Traceable: No, Indenter: Diamond, Block Size: 2" x 2"
Scale: HRD, Value: 65 (+/-3), Traceable: No, Indenter: Diamond, Block Size: 2" x 2"
Scale: HRD, Value: 70 (+/-3), Traceable: No, Indenter: Diamond, Block Size: 2" x 2"
Scale: HRE, Value: 75 (+/-3), Traceable: No, Indenter: 1/8" Steel, Block Size: 2" x 2"
Scale: HRE, Value: 80 (+/-3), Traceable: No, Indenter: 1/8" Steel, Block Size: 2" x 2"
Scale: HRE, Value: 85 (+/-3), Traceable: No, Indenter: 1/8" Steel, Block Size: 2" x 2"
Scale: HRE, Value: 90 (+/-3), Traceable: No, Indenter: 1/8" Steel, Block Size: 2" x 2"
Scale: HRE, Value: 95 (+/-3), Traceable: No, Indenter: 1/8" Steel, Block Size: 2" x 2"
Scale: HRE, Value: 100 (+/-3), Traceable: No, Indenter: 1/8" Steel, Block Size: 2" x 2"
Scale: HRE, Value: 75 (+/-3), Traceable: No, Indenter: 1/8" Carbide, Block Size: 2" x 2"
Scale: HRE, Value: 80 (+/-3), Traceable: No, Indenter: 1/8" Carbide, Block Size: 2" x 2"
Scale: HRE, Value: 85 (+/-3), Traceable: No, Indenter: 1/8" Carbide, Block Size: 2" x 2"
Scale: HRE, Value: 90 (+/-3), Traceable: No, Indenter: 1/8" Carbide, Block Size: 2" x 2"
Scale: HRE, Value: 95 (+/-3), Traceable: No, Indenter: 1/8" Carbide, Block Size: 2" x 2"
Scale: HRF, Value: 75 (+/-3), Traceable: No, Indenter: 1/16" Steel, Block Size: 2" x 2"
Scale: HRF, Value: 80 (+/-3), Traceable: No, Indenter: 1/16" Steel, Block Size: 2" x 2"
Scale: HRF, Value: 85 (+/-3), Traceable: No, Indenter: 1/16" Steel, Block Size: 2" x 2"
Scale: HRF, Value: 90 (+/-3), Traceable: No, Indenter: 1/16" Steel, Block Size: 2" x 2"
Scale: HRF, Value: 95 (+/-3), Traceable: No, Indenter: 1/16" Steel, Block Size: 2" x 2"
Scale: HRF, Value: 100 (+/-3), Traceable: No, Indenter: 1/16" Steel, Block Size: 2" x 2"
Scale: HRF, Value: 75 (+/-3), Traceable: No, Indenter: 1/16" Carbide, Block Size: 2" x 2"
Scale: HRF, Value: 80 (+/-3), Traceable: No, Indenter: 1/16" Carbide, Block Size: 2" x 2"
Scale: HRF, Value: 85 (+/-3), Traceable: No, Indenter: 1/16" Carbide, Block Size: 2" x 2"
Scale: HRF, Value: 90 (+/-3), Traceable: No, Indenter: 1/16" Carbide, Block Size: 2" x 2"
Scale: HRF, Value: 95 (+/-3), Traceable: No, Indenter: 1/16" Carbide, Block Size: 2" x 2"
Scale: HRF, Value: 100 (+/-3), Traceable: No, Indenter: 1/16" Carbide, Block Size: 2" x 2"